'Crosstalk' is a collaborative interactive performance work by visual artist Simon Biggs, composer Garth Paine, and dance artist Sue Hawksley. Software development by Hadi Mehrpouya. 'Crosstalk' is for two performers whose movement and speech are re-mediated within an augmented environment employing real-time 3D motion tracking, multi-source voice recognition, interpretative language systems, 3D visualisation employing a custom physics engine, large scale projection and surround-sound audio synthesis. 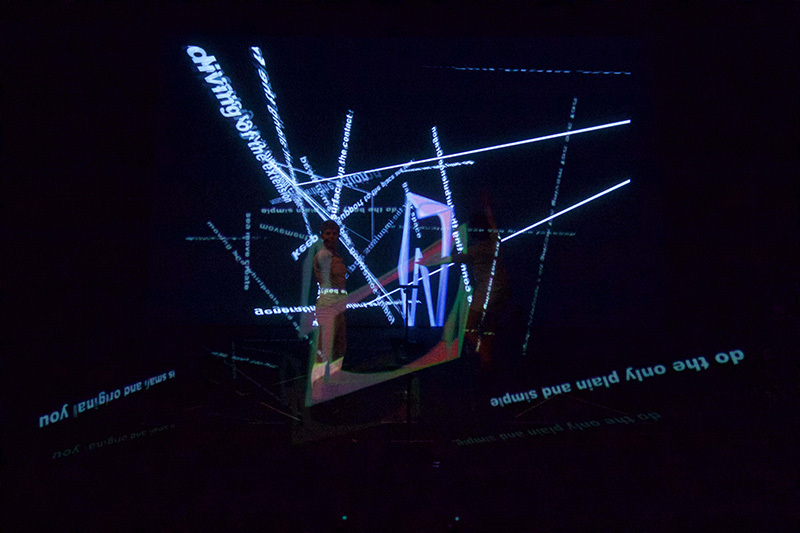 The acquired speech of the dancers is re-mediated through projected digital display and sound synthesis, the performers causing texts to interact and recombine with one another through their physical actions. The elements in the system all effect how each adapts, from state to state, as the various elements of the work - people, machines, language, image, movement and sound - interact with one another. 'Crosstalk' seeks to consider social relations, as articulated in language acts of various kinds (the performative), in relation to the generative ontologies of self-hood and the capacity of mediated social space to 'make people'. Crosstalk has been researched and developed whilst the artists were in residence at the Bundanon Trust, New South Wales, Australia in July 2013, with further development and production at Arizona State University, USA, in January 2014. A developmental version of Crosstalk was premiered at the Edinburgh International Festival, 2013. The work has also been performed at the 2015 Electronic Literature Organization's conference, University of Bergen, Norway and at the Hartley Theatre, University of South Australia, 2016. The work has also been presented at the Theatre and Performance Research Association conference, Royal Conservatoire of Scotland, Glasgow, UK, September 2013 and the Movement and Computing (MOCO) conference, IRCAM/Pompidou, Paris, 2014.
full video documentation of Crosstalk performed at the University of South Australia, Adelaide, 2016 (with Sue Hawksley and Tanya Voges). 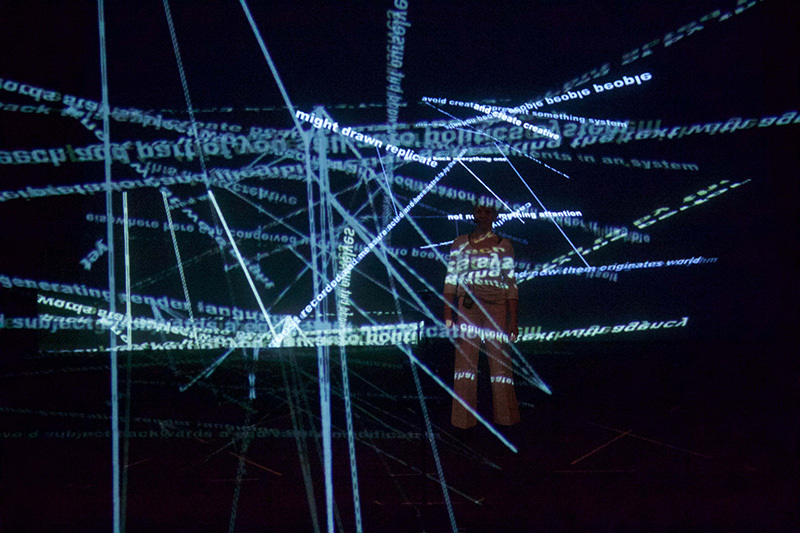 full video documentation of Crosstalk performed at Arizona State University Art Museum, Tempe, USA, 2014 (with Sue Hawksley and Angel Crissman). 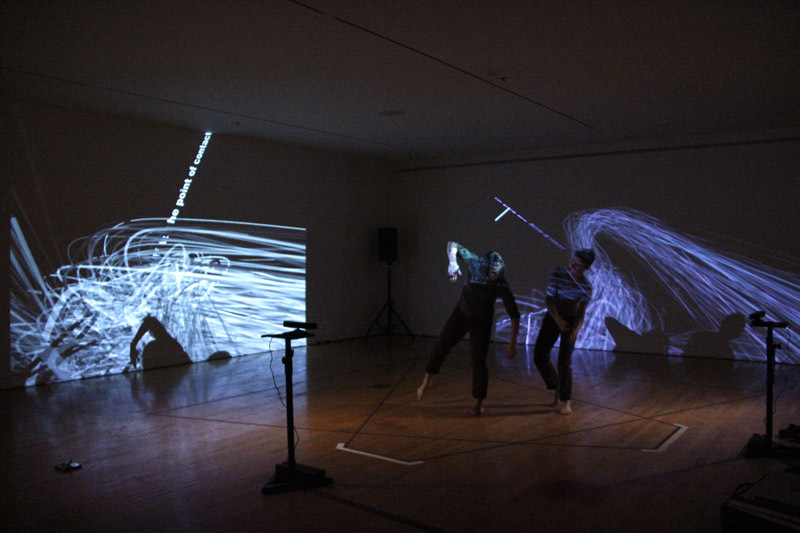 edited video documentation of Crosstalk performed at Arizona State University Art Museum, Tempe, USA, 2014 (with Sue Hawksley and Angel Crissman). video of Crosstalk performed as part of Glitch'd, Edinburgh International Festival, 2013 (with Lucy Boyes). Still from performance at the Hartley Theatre, Adelaide, Australia, 2016 (with Sue Hawksley & Tanya Voges). Still from performance at the Arizona State University Art Museum, Tempe, USA, 2014 (with Sue Hawksley & Angel Crissman).